So, for the most part there are no hard and fast rules to writing because every writer, and every mind, is different and what works for one will not work for all. Except in this one case. 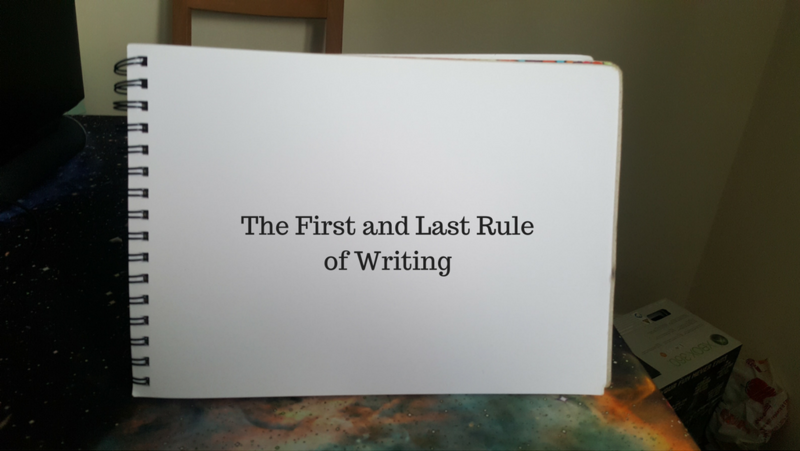 After years of practice, study, more practice and more study I have concluded there is indeed one rule that governs all successful writing. In fact it is my writing mantra and I am going to share it with you now. Like it? Simple isn’t it? It is simple but it actually has a lot of power to it if you can believe it and follow it. One of the things that I found when I was at University was that many of my classmates were shy about sharing their work. Leaving the shyness aside for a moment, it highlighted that people were also a bit embarrassed about their first drafts. Also leaving aside for just a minute that work shopping a first draft written five minutes ago is of limited value (in my opinion), you can understand the hesitancy of folks not wanting to share their work. A writer is exposing some of their thought processes to the world and you will naturally have the fear that you will be judged harshly for it. This is where the rule comes in and, hopefully, helps. It acknowledges that first (or even early) drafts may not be great. This is true for most writers I would wager. Anyone judging your work harshly based on a first draft is making a judgement that is unfair. Writing is not just about getting the idea onto the page but refining it, and refinement takes time and drafting. You don’t have to be right first time, that is absolutely acceptable. Taking this outwith the classroom, this element to my mantra still applies as it helps with the empty page syndrome. You don’t have to get it right first time…but if you don’t start, then you guarantee your own failure. And that is where the second half of the mantra comes in. If you can overcome blank page syndrome, then the words will start to flow. And when that happens you are infinitely further ahead than you were 60 seconds ago when you had nothing. If you can release your fear of a poorer earlier performance in order to get that first paragraph, that first sentence, that first word, written then you accept that it is more important to write literally anything than nothing, and you accept that you can rework it later. Suddenly you find that with the first few words on your page or screen, it is no quite so intimidating which means it is easier to continue. And if you did it once, you can do it again, right? And that is it. Be aware that the first draft is not going to be perfect. Accept that and move on. You may find some help in coming to this way of thinking in my post “Redefining Failure“. Once you have accepted that first drafts are rarely perfect (and let’s face it, they aren’t meant to be) then you can overcome your terrifying empty page by filling it with words. Once you have done that, you can polish it as much as you like! I hope this helps. Bye for now!